Zea Maize belongs to the main crops of the Steppe Zone of Ukraine due to the valuable properties of grain and leafy mass, universal use for livestock, poultry, as well as industrial processing, including alternative fuels. The rapid spread of simple hybrids is hampered by the low productivity of parental forms in hybridization areas and the high cost of seed production. Therefore, today the issues of growing seeds of parental forms, which require the refinement of a complex of agrotechnological measures in growing in the dry conditions of the Southern Steppe of Ukraine, remain pressing issues. Studies conducted in Ukraine and abroad have shown that the seed yield of self-pollinated corn lines is one of the main indicators of the efficiency of the use of breeding material, which directly affects the economic and energy indicators of production as parental forms, and in the future – the hybrid. The intensity of the production process in maize hybridization areas can vary significantly depending on the influence of various environmental factors during the growing season, in the first place – moisture content of precipitation, temperature and relative humidity of air, availability of available nutrients in the soil, etc. Parent forms of corn require individually determined elements of cultivation technology at hybridization sites, depending on the genetic potential of plants, peculiarities of soil-climatic conditions of growing under conditions of climate change associated with temperature rise, violation of the uniformity of rainfall, reduction of periods with optimal weather conditions, etc. 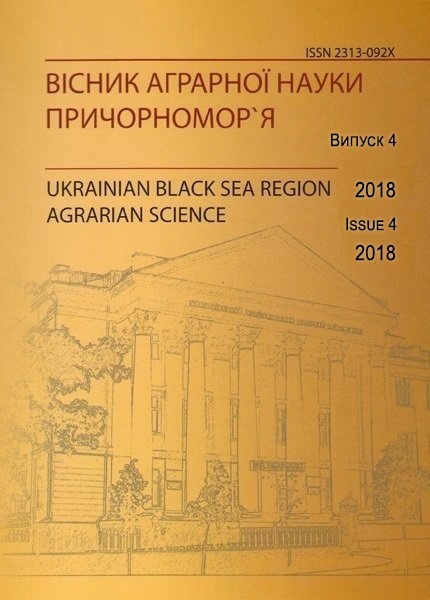 Therefore, there is a need to conduct field experiments with maize in the south of Ukraine for the purpose of developing varietal agrotechnics and ensuring high and economically justified yields of hybrid seeds for the rational use of irrigation water, mineral fertilizers, energy and labor resources, preservation of soil fertility, reduction environmental pressure on the agroecosystem. Yugenkheymer R. U.(1979). Kukuruza: uluchshenie sortov, proizvodstvo semyan, ispol‘zovanie. Moskva: Kolos [in Russian]. Ostapov, V. I., Andrusenko, I. I. & Baryl’nik, V. T. et al. (1987). Oroshaemoe zemledelie. Kiev: Urozhay [in Russian]. Alpat’ev, A. M. (1966). Formirovanie polivnogo rezhima sel’skokhozyaystvennykh kul’tur na osnove operativnogo ucheta summarnogo ispareniya. Kiev: Urozhay [in Russian]. Vavilov, P. P., Gritsenko, V. V. & Kuznetsov M. A. (1981). Rastenievodstvo. Moskva: Kolos [in Russian]. Vozyska, N. S. & Taova, L. A. (1982). Proizvodstvo kukuruzy v Bolgarii. Sel’skoe khozyaystvo za rubezhom. 12, 8–10 [in Russian]. Horskyi, O. I. & Budanov, M. F. (1967). Volohozariadkovi polyvy v Stepovii zoni Ukrainskoi RSR. Kyiv: Derzhsilhospvydav [in Ukrainian]. Kokovikhin, S. V. (1999). Zalezhnist produktyvnosti kukurudzy na nasinnia vid polyvnoho rezhymu, dobryv ta hustoty posivu roslyn. Melioratsiia i vodne hospodarstvo. Kyiv: Ahrarna nauka [in Ukrainian]. Dziubetskyi, B. V., Pysarenko, V. A., Lavrynenko, Yu. O. & Kokovikhin, S. V. (2000). Morfo-fiziolohichni pokaznyky produktsiinoho protsesu ta vrozhai nasinnia materynskoi formy Borysfenu 433 MV v umovakh Pivdennoho Stepu Ukrainy. Biuleten Instytutu zernovoho hospodarstva. 14, 20–22 [in Ukrainian]. Bagrov, M. N. & Kruzhilin, I. P. (1985). Sel’skokhozyaystvennaya melioratsiya. Moskva: Agropromizdat [in Russian]. Dushkin, A. N.(1981). Osobennosti sortovoy agrotekhniki gibrida Dokuchaevskiy. Kukuruza. 1, 25 [in Russian]. Eremeev, Yu. N. & Mikhaylin, A. S. (1983). Rezhimy orosheniya sel’skokhozyaystvennykh kul’tur. Moskva: Rossel’khozizdat [in Russian]. Kiver, V. Kh & Halechko, I. D. (1995). Normy, sposoby ta stroky vnesennia dobryv pid kukurudzu na zroshenni. Enerhozberihaiuchi tekhnolohii vyroshchuvannia zernovykh kultur u Stepu Ukrainy, 61–66 [in Ukrainian]. Efimov, I. T. (1971). Oroshenie i udobrenie kukuruzy. Moskva: Kolos [in Russian]. Lavrynenko, Yu.O., Pysarenko, V.A., Kokovikhin, S.V. & Pysarenko P.V. (2008). Naukovo-praktychni aspekty formuvannia rezhymiv zroshennia hibrydiv kukurudzy riznykh hrup styhlosti v umovakh pivdnia Ukrainy. Zroshuvane zemlerobstvo. 50, 23–31 [in Ukrainian]. Zolotov, V. I., Suvora, V. P. & Pashchenko, Yu. M. (1986). Sovershenstvovanie sortovoy agrotekhniki samoopylennykh liniy. Kukuruza i sorgo. Moskva: Agropromizdat. 4, 34–35 [in Russian]. Khromiak, V. M. (2005). Optymizatsiia hibrydnoho skladu kukurudzy v umovakh skhidnoi chastyny Stepu Ukrainy. Extended abstract of candidate’s thesis. Kharkiv [in Ukrainian]. Ionova, Z. M. & Nesterova, G. S. Vozdelyvanie kukuruzy pri oroshenii. Moskva: VNIITEISKh [in Russian]. Kokovikhin, S. V. (1999). Vodospozhyvannia kukurudzy v umovakh Pivdennoho Stepu na diliankakh hibrydyzatsii. Visnyk ahrarnoi nauky, 9, 78–79 [in Ukrainian]. Gudz’, Yu. V. & Lavrinenko, Yu. A. (1995). Semenovodstvo kukuruzy na oroshaemykh zemlyakh. Kherson [in Russian]. Kiver, V. F., Bakay, S. S. & Rybka, V. S. et al. (1988). Metodicheskie rekomendatsii po bioenergeticheskoy otsenke tekhnologiy vozdelyvaniya kukuruzy. Moskva: Tipografiya VASKhNIL [in Russian]. Metodicheskie rekomendatsii po provedeniyu polevykh opytov v usloviyakh orosheniya USSR (1985). Dnepropetrovsk [in Russian]. Boyarskiy, A. Ya. (1985). Obshchaya teoriya statistiki. Moskva: Izdatel’stvo Moskovskogo universiteta [in Russian]. Ostapov, V. I. (1977). Tekhnologiya vyrashchivaniya i uborki kukuruzy na oroshaemykh zemlyakh yuga Ukrainy. Kiev: Vishcha shkola [in Russian]. Pashchenko, Yu.M. (1995). Sortovi osoblyvosti vyroshchuvannia nasinnia hibrydiv kukurudzy Dniprovskyi 203 MV i Dniprovskyi 284 MV. Enerhozberihaiuchi tekhnolohii vyroshchuvannia zernovykh kultur u Stepu Ukrainy. Dnipropetrovsk: Porohy, 51 [in Ukrainian]. Gulyaev, G.V. & Guzhov, Yu.L. (1972). Selektsiya i semenovodstvo polevykh kul’tur. Moskva: Kolos [in Russian]. Zaporozhchenko, A.L. (1978). Kukuruza na oroshaemykh zemlyakh. Moskva: Kolos [in Russian]. Pisarenko, V.A., Lavrinenko, Yu.A. &, Kokovikhin, S.V. (2000). Tekhnologicheskiy pasport vyrashchivaniya semyan gibrida kukuruzy Borisfen 433 MV v usloviyakh orosheniya yuzhnoy Stepi Ukrainy. Informatsionnyy listok. Kherson: KhGTsNTI. 27 [in Russian]. Andreeva, N. M. (1978). Razvitie spetsializatsii sel’skokhozyaystvennogo proizvodstva v SShA v usloviyakh APK. Moskva: VNIITEISKh [in Russian]. Struminskyi, Yu.M. (1999). Shliakhy pidvyshchennia produktyvnosti i pokrashchennia yakosti batkivskykh form hibrydiv kukurudzy. Zemlerobstvo XXI stolittia – problemy ta shliakhy vyrishennia: materialy Mizhnarodnoi naukovo-praktychnoi konferentsii (p. 213). Kyiv: Nora-Print [in Ukrainian]. Sychikov, L. A. (1998). Vliyanie gustoty rasteniy i doz gerbitsida na urozhay materinskoy formy gibrida Kross 454 M. Biuleten Instytutu zernovoho hospodarstva. Dnipropetrovsk, 6-7,. 91–93. [in Russian]. Tarasov, O. V., Kochetkov, V. S. & Malykhina, V. F. (1974). Kukurudza v Stepu Ukrainy. Donetsk: Donbas [in Ukrainian]. Tsykov, V. S. (1998). Dneprovskye hybrydы kukuruzы na poliakh ahrofyrmы “Naukova”. Kukuruza y sorho. 2,. 5 [in Russian]. Shtoyko, D. A. & Isichko, M. P. (1971). Vodopotreblenie i rezhim orosheniya sel’skokhozyaystvennykh kul’tur. Kiev: Naukova dumka [in Russian]. Abelmasov, O. V. & Ilchenko, L. A. (2018). Combining ability of the new genetic plasma Iodent during the maize hybrids’ selection for Steppe zone of Ukraine. Plant Varieties Studying and Protection. 14(3), 262–269. DOI: 10.21498/2518-1017.14.3.2018.145287. 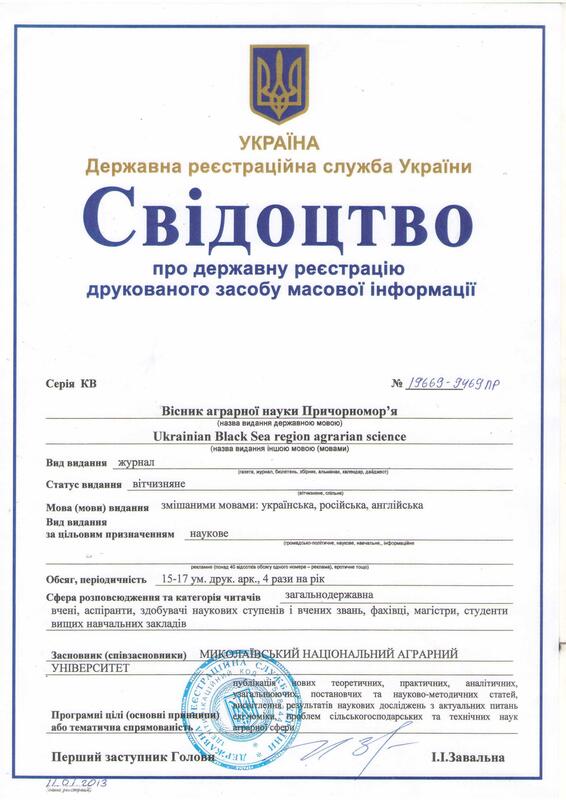 Retrieved from: http://nbuv.gov.ua/UJRN/stopnsr_2018_14_3_4 [in Ukrainian]. Chilashvili, I.M., Suprunov, A.I. & Slashchev, A.Yu. (2015). Izuchenie kombinatsionnoy sposobnosti novykh samoopylennykh liniy kukuruzy v usloviyakh tsentral’noy zony Krasnodarskogo kraya. Zernovoe khozyaystvo Rossii.4, 46-50 [in Russian]. Domashnee, P.P., Dzyubetskiy, B.V. & Kostyuchenko, V.I. (1992). Selektsiya kukuruzy. Moskva: Agropromizdat [in Russian]. Oleshko, O.A. (2002). Selektsiia samozapylenykh linii kukurudzy na osnovi hibrydiv, stvorenykh za uchastiu linii riznykh henetychnykh plazm, kontrastnykh za dovzhynoiu vehetatsiinoho periodu. Doctors thesis. Dnipropetrovsk: Instytut zernovoho hospodarstva UAAN [in Ukrainian]. Krivosheev, G. Ya. & Shevchenko N. A. (2014). Obshchaya i spetsificheskaya kombinatsionnaya sposobnost’ samoopylennykh liniy kukuruzy po priznaku urozhaynost’ zerna. Nauchnyy zhurnal KubGAU. 104. Retrieved from: http://ej.kubagro.ru/2014/10/pdf/47.pdf [in Russian]. Riabchenko, E. M. (2016). Creating of the self-pollinated lines of maize on the basis plasma Lancaster with using the haploid method. Doctors thesis. Dnipro: Instytut zernovoho hospodarstva NAAN [in Ukrainian]. Volkodav V.V. (Ed.). (2001). Zernovi, krupiani ta zernobobovi kultury. Metodyka derzhavnoho sortovyprobuvannia silskohospodarskykh kultur.2 [in Ukrainian]. Bakai, S.S. & Ilchenko, T.V. (1997). Vartist naukovoho zabezpechennia ta naukovoho obsluhovuvannia v nasinnytstvi kukurudzy. Biuleten Instytutu zernovoho hospodarstva. 4, 102–104. [in Ukrainian]. Hurieva, I.A., Riabchun, V.K. & Kozubenko L.V. (2003). Metodychni rekomendatsii polovoho ta laboratornoho vyvchennia henetychnykh resursiv kukurudzy. Kharkiv [in Ukrainian]. Dremlyuk, G.K. & Gerasimenko, V.F. (1992). Priemy analiza kombinatsionnoy sposobnosti EVM-programmy dlya neregulyarnykh skreshchivaniy. Odessa: SGI [in Russian]. Dziubetskyi, B.V., Chornomyz, A.M. & Zaplitnyi, Ya.D. (2011). Vyvchennia hospodarsko-tsinnykh oznak inbrednykh linii kukurudzy zarodkovykh plazm Aiodent, Laukon ta Zmishana v umovakh Zakhidnoho Lisostepu. Biuleten Instytutu zernovoho hospodarstva UAAN. 1, 91-97 [in Ukrainian]. Halechko, I.D. (2007). Optymizatsiia elementiv rannoho testuvannia kukurudzy. Biuleten Instytutu zernovoho hospodarstva UAAN. 31-32, 23–26 [in Ukrainian]. Haydash, O. L. (2016). Assessment of combining ability for grain yield of self-pollinated S5 maize (Zea mays L.) families of mixed germplasm. Plant Varieties Studying and Protection. 1., 62-66. DOI: 10.21498/2518-1017.1(30).2016.61781. Retrieved from: http://journal.sops.gov.ua/article/view/61781/57542 [in Ukrainian]. Zozulya, A.L. (1983). Anatomo-morfologicheskie sposoby otsenok selektsionnogo materiala kukuruzy. Selektsiya i semenovodstvo kukuruzy. Kiev: Urozhay. 55, 27–30 [in Russian]. Balyura, V.I. (1980). Ploshchad’ list’ev i gustota stoyaniya rasteniy. Kukuruza. 5, 33–37 [in Russian]. Palamarchuk, V.D., Klymchuk, O.V., Polishchuk, I.S. & et al. (2010). Ekoloho-biolohichni ta tekhnolohichni pryntsypy vyroshchuvannia polovykh kultur. Vinnytsia: Vinnytskyi natsionalnyi ahrarnyi univestytet [in Ukrainian]. Kalenska, S.M., Yermakova, L.M., Palamarchuk, V.D. & et al. (2015). Systema suchasnykh intensyvnykh tekhnolohii u roslynnytstvi. Vinnytsia: FOP Rohalska I.O. [in Ukrainian]. Kolisnyk, O.M. (2016). Vykhidnyi material dlia selektsii kukurudzy na stiikist do pukhyrchatoi sazhky. Visnyk Umanskoho universytetu sadivnytstva. 1, 63-65 [in Ukrainian]. This entry was posted in , №4(100)2018 and tagged Я. В. Бєлов. Bookmark the permalink. ← K. Karpenko, T. Gerasko, S. Vdovenko. Growth and development of tomato varieties in the open field under the influence of biologics.